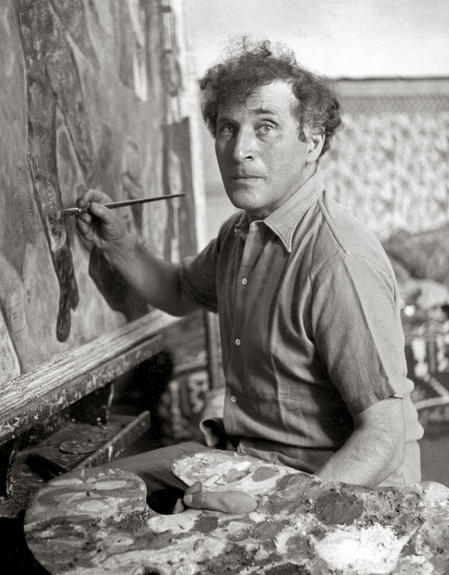 February 20, 1958 -- Marc Chagall arrives in Chicago to deliver three lectures at the University of Chicago under the auspices of the Committee on Social Thought. Dr. John U. Nef, the chairman of the committee, a man who has worked for over a year to get Chagall’s visit approved, introduces the artist to the assembled group. Speaking in French, Chagall speaks of “mankind’s need to reform to first principles: love thy neighbor as thyself, forgive thine enemies.” [Chicago Daily Tribune, February 21, 1958] The artist says, “For me life divides itself into two parts – Life and Death – and for me whatever is not an inner truth is death. But maybe – to be a little more concrete – or, if you prefer, more truthful, one must use the word ‘love,’ because there is the true color, not only in art, but in life.” During his stay, Art Institute officials will photograph him with his works, and for the first time in forty years he will see “Birth,” one of his early paintings that the late Maurice Culberg donated to the museum. It would be another decade before Chagall would return to a dramatically changed city to supervise the installation of his “Four Seasons” mosaic at the corner of Randolph and Dearborn Streets. February 20, 1947 -- The Illinois Department of Aeronautics approves Chicago's plan for the construction of the Northerly Island downtown air terminal. There are a couple of caveats -- no instruction flights would be permitted and the airport must be closed under unfavorable wind conditions. Additionally, a power boat must be kept available at all times for emergency use and pleasure boats would need to be prevented from becoming obstructions in landing approach zones. The island, originally created for the 1933 and 1934 Century of Progress World's Fair, is gone now and is in the process of being converted to a multi-use recreational area. 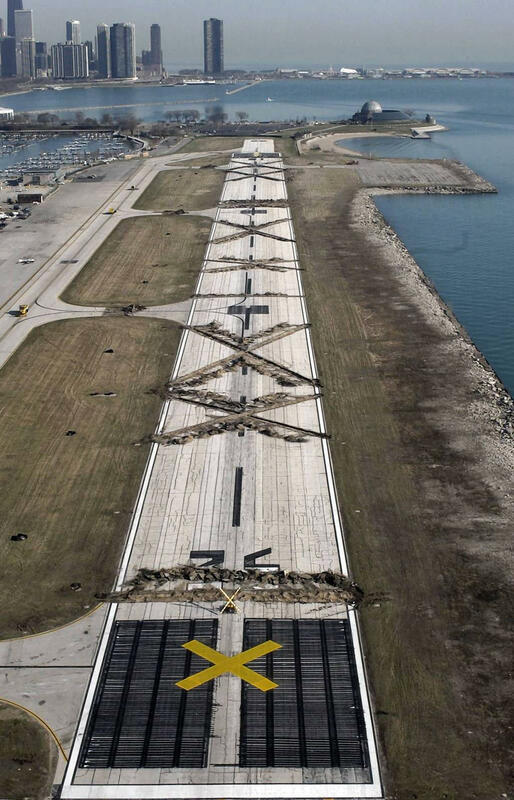 The new incarnation of the park began at about 1:30 in the morning on March 31, 2003 when Mayor Daley ordered the bulldozing of the runway at Meigs with no advance warning, not even to the FAA.